Recently, I have become interested in what one might call discrete differential geometry. Differential geometry is concerned with the differential properties of manifolds, in particular surfaces. In the real world one usually does not have a manifold but a collection of points that lie on a supposed manifold. One can make these points into a triangulation. The question is, since differential geometry is so successful at describing surfaces, can we carry over notions from it to triangulations, ie, the discrete setting? We are in the process of answering this question. One fruitful area of study has been in generalizing the Laplace-Beltrami operator. In the differential setting this allows one to say a lot about a manifold. 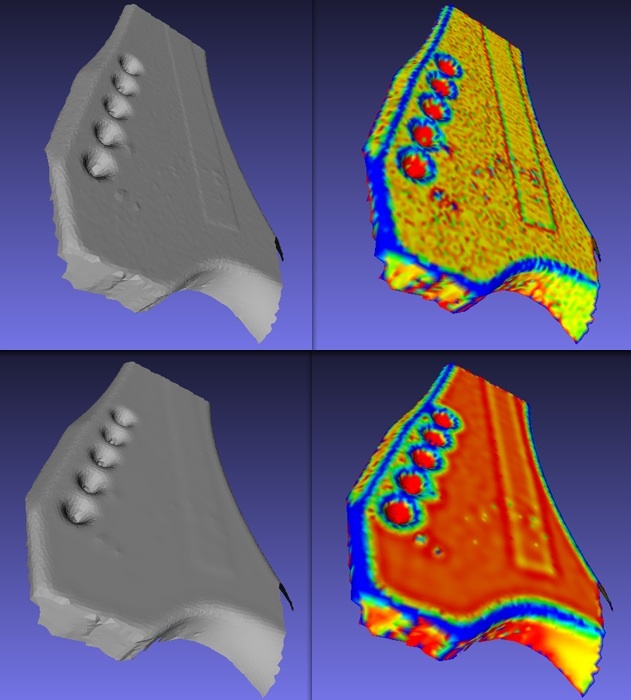 In the discrete case it allows us to analyze, smooth, compare and match shapes. As an example of what can be done look at the following picture. The top two pictures are the scan of the original scan with the colors in the right image depicting the mean curvature. The bottom two pictures show the surface after being smoothed using bending energy flow (rather than Laplacian flow). One feature of the method used is that I have limited the shrinkage and drifting that is generally found in Laplacian and other energy-based flows. By comparing the coloured pictures, note however, that not all errors have been successfully removed. An important area of research is to find methods to automate or semi-automate the smoothing so that errors are detected and dealt with. The area of discrete differential geometry has many applications: computer graphics and animation, medical imaging, computer vision and so on. Humans can easily spot a wheel in a photograph, even though it may look like an ellipse rather than a circle. Computers on the other hand, find it very difficult. An important problem in shape recognition is to find mathematical invariants that help computers recognize objects from photographs. In mathematics this is a problem in affine geometry rather than Euclidean geometry. An important invariant in the Euclidean geometry setting is the medial axis. This encodes information about a shape but there is currently no generally accepted version in the affine setting. The aim of the PhD project is to use an affine version of the Laplace-Beltrami operator in differential geometry to provide such a version. Hence, the work is part of the fast-moving and exciting area of of geometric flows in differential geometry and the study of PDEs. The Laplace-Beltrami operator has been said to give the "DNA" of a shape and so the affine version should produce many invariants for studying not just photographs in image analysis but for many other manifolds too. The smoothing process above needs to work in the real world. Can we make it more accurate? Can we make it automatic or at least semi-automatic? Can we increase the speed? Morphology is the study of how objects change. For example how does the shape of a bone change as an animal grows. Can we use discrete differential geometry to discover new results in this ancient subject?